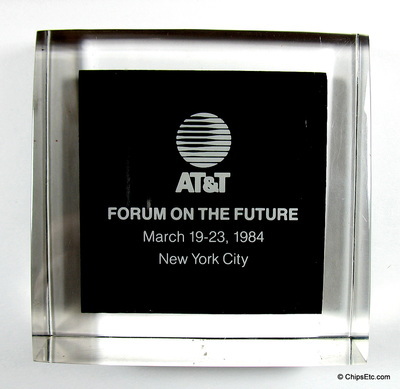 This Lucite paperweight from AT&T features two Integrated Circuit memory chips used in their 3B line of 32-bit UNIX-based minicomputers that controlled their 1B TSPS (Traffic Service Position System) telephone system. 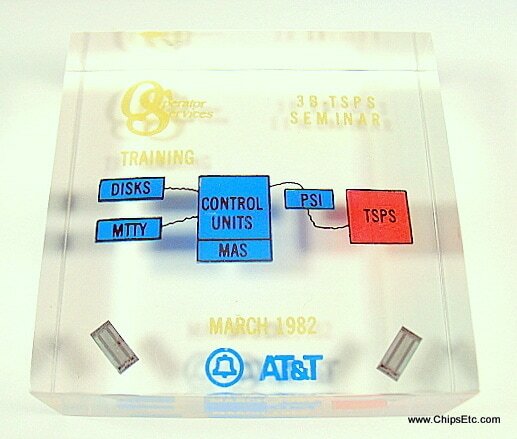 ​The paperweight was given to attendees of the March 1982 AT&T Operator Services 3B TSPS training seminar. The Bell System invented the centralized TSPS automated operator computer system in 1969. It utilized Electronic Switching technology. 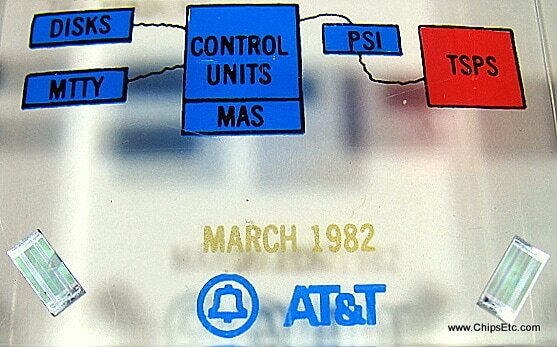 AT&T's first No 1B TSPS system was introduced in march 1982 in Redwood City CA. 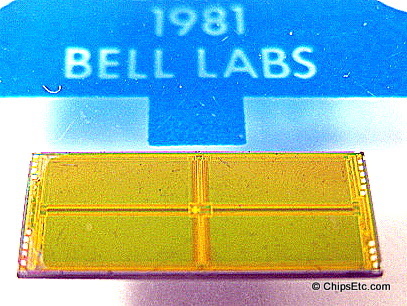 The No 1B system was an upgrade to their original No 1 TSPS systems and was 160% faster. 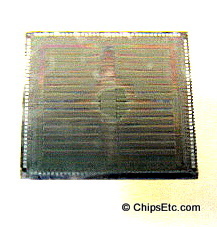 AT&T would used their new 3B20 processor to upgrade all 152 of their older No 1 TSPS systems within the next six years. 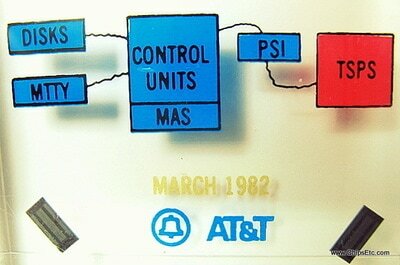 Paperweight has diagram showing the system's key components: Disks, MTTY, Control Units, MAS, PSI, and the TSPS. 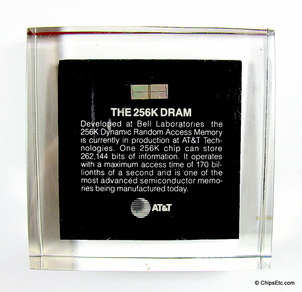 This Lucite paperweight features a 256 DRAM chip from AT&T. 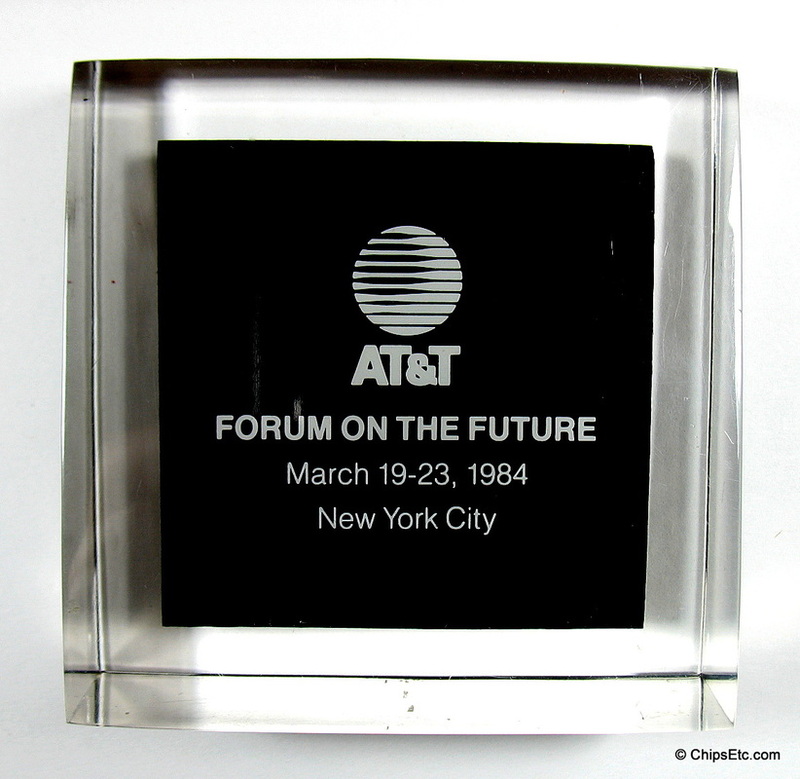 The paperweight was issued to commemorate the "Forum on the future" conference which took place March 19-23, 1984 in New York City. 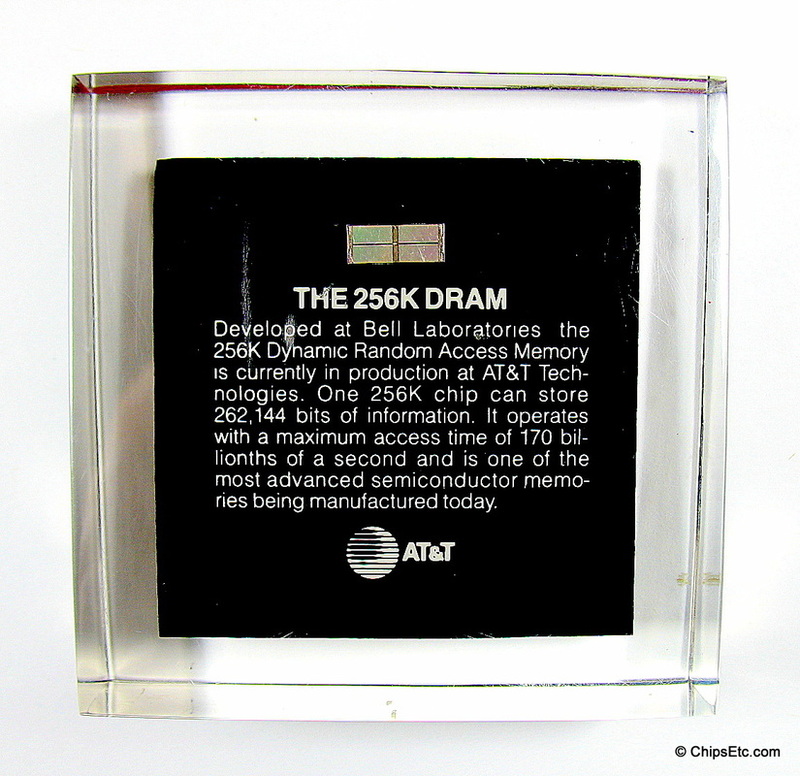 Reads on the back: "Developed at Bell Laboratories, the 256K Dynamic Random Access Memory is currently in production at At&t Technologies. 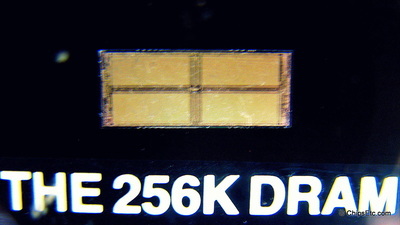 One 256K chip can store 262,144 bits of information. 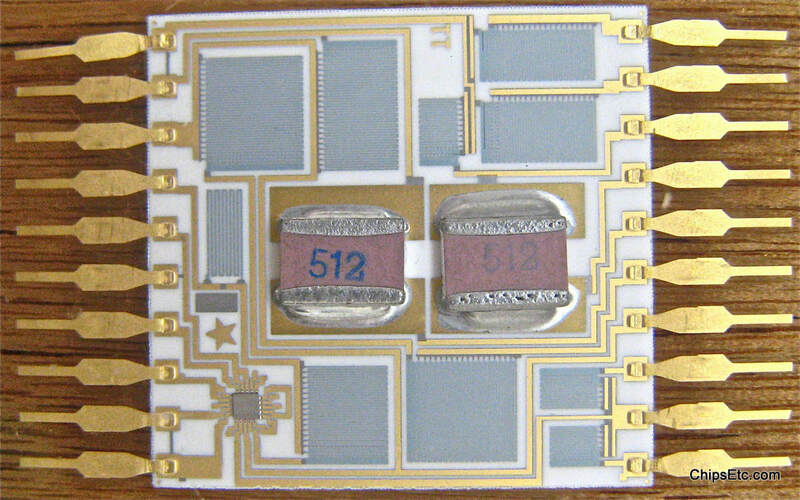 It operates with a maximum access time of 170 billionths of a second and is one of the most advanced semiconductor memories being manufactured today." Item measures 3 in. tall x 3 in. wide and tapers from 1 in. at the base to ⅝" at the top. ​" I received this as a gift from my father who attended the conference. He was also one of the expert witnesses at the AT&T hearings that resulted in AT&T spinning off it's local operating companies in that same year, breaking up what had been one of the largest corporations in America at the time." 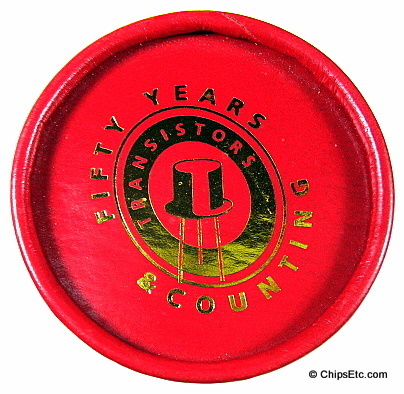 This Lucite paperweight features a National semiconductor 56480-29 14-lead DIP chip used in the Bell Telephone Electronic Switching network. 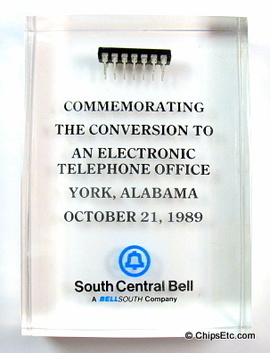 The paperweight was issued to commemorate the completion of the conversion to a fully electronic switching system at the York, Alabama South Central Bell telephone office in 1989. 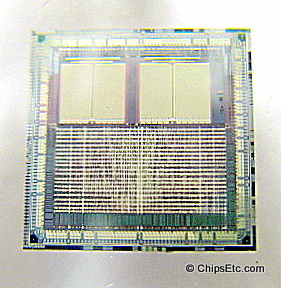 Clock measures 5 1/4" high x 4" wide and has a holographic replica image of a Lucent Technologies IC chip on the base. The clock face is 3" round in diameter, has "Allentown", " & "1947-1997" color graphics. 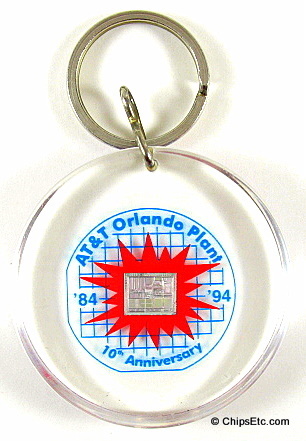 This Lucite keychain contains an actual semiconductor chip produced at AT&T's Orlando Florida chip making plant. 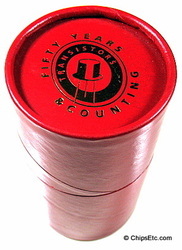 It was given out to employees to celebrate the 10 year anniversary of it's CMOS Integrated Circuit manufacturing plant, from 1984 to 1994. 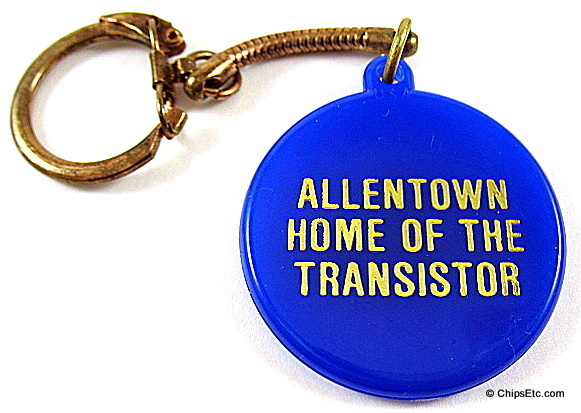 This Lucite keychain contains a real AT&T transistor produced at their Allentown Works plant. It reads "Allentown home of the transistor, 1951- 1994, AT&T". 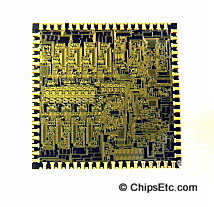 On October 01, 1951 the first assembly line for the mass production of transistors was started at Western Electric's Allentown Works, only four years after it was first invented by Bell labs. An end of an era came 43 years later when workers assembled the final batch of transistors on July 02, 1994. 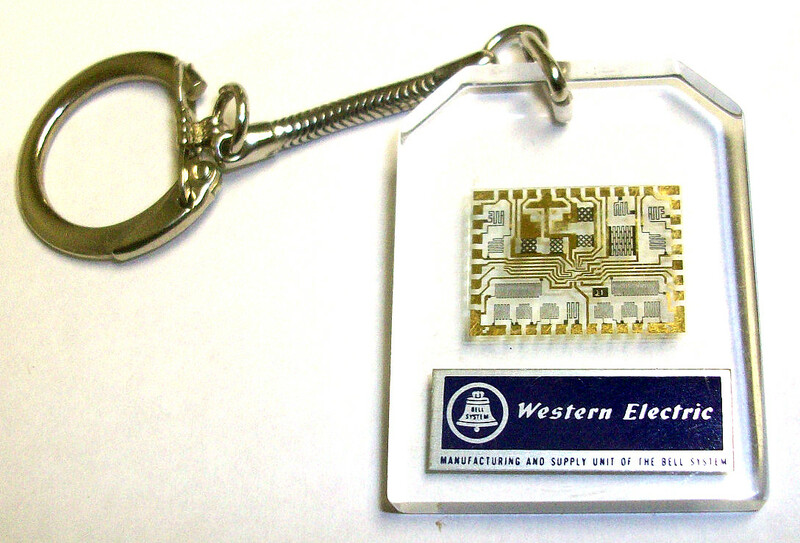 This Lucite keychain features a Western Electric thin film circuit with gold traces. 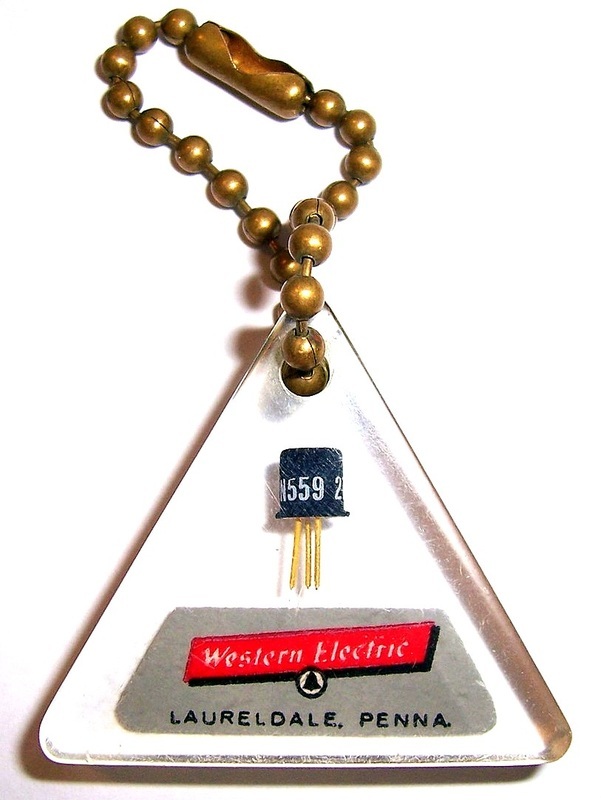 This Lucite keychain features a Western Electric 2N559 diffused-junction germanium PNP Transistor made at their Laureldale, Pennsylvania plant. The original 2N559 was one of the first military-rated computer transistors to be made. The Remington Rand UNIVAC Target Intercept Computer (TIC) from 1960 used over 20,000 Western Electric 2N559 transistors in it's logic circuits. 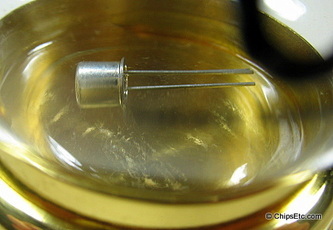 This Lucite keychain features a real Western Electric gold transistor with the can removed to show the internals of the transistor. 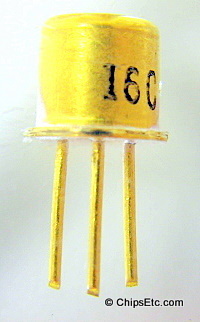 This transistor was also produced at Western Electric's Allentown Works plant. New & unused. Measures 1 7/16" by 1 1/8" wide. 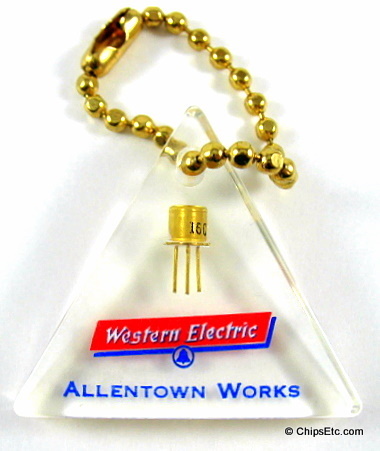 This Lucite keychain features a real 16C Western Electric gold canned transistor with stamped 10-64 date code, produced at Western Electric's Allentown Works transistor manufacturing plant. 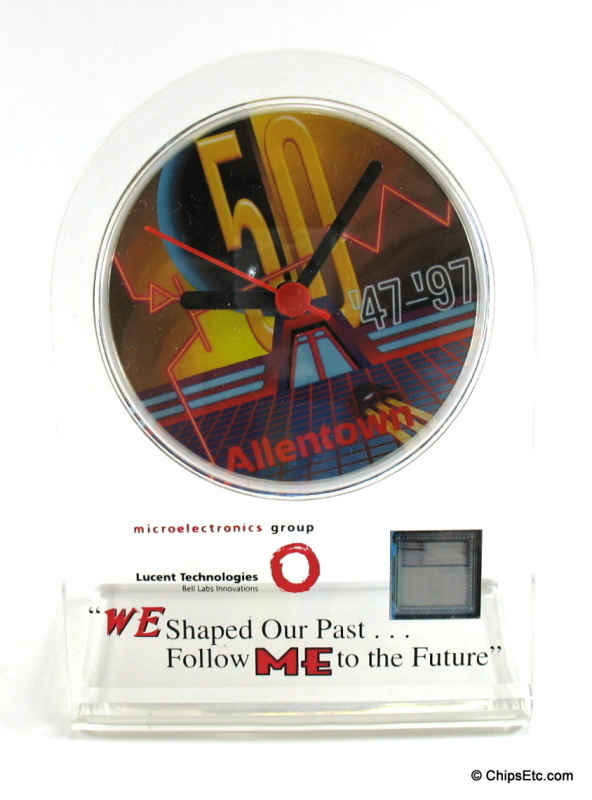 This item was given to Lucent technology employees working in the Microelectronics Group in 1997 in celebration of the 50th anniversary of the Transistor invented by AT&T's Bell Labs. 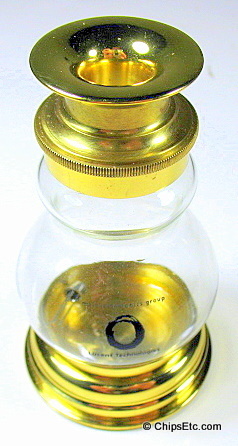 Victoria style looking glass features solid brass end-pieces and inside it contains an actual AT&T Western Electric Transistor. Comes with original anniversary display tube and note from Lucent technology management celebrating this anniversary event. One hundred years ago, the Victorian "viewing jar" was a popular way to display tiny treasures from butterflies to cameos. 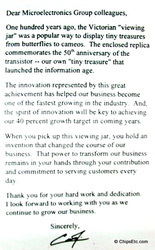 The enclosed replica commemorates the 50th anniversary of the transistor -- our own 'tiny treasure" that launched the information age. The innovation represented by this great achievement has helped our business become one of the fastest growing in the industry. And the spirit of innovation will be key to achieving our 40 percent growth target in coming years. 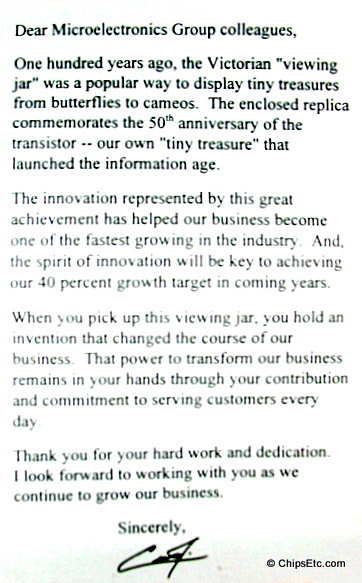 When you pick up this viewing jar, you hold an invention that changed the course of our business. That power to transform our business remains in your hands through your contribution and commitment to serving customers every day. 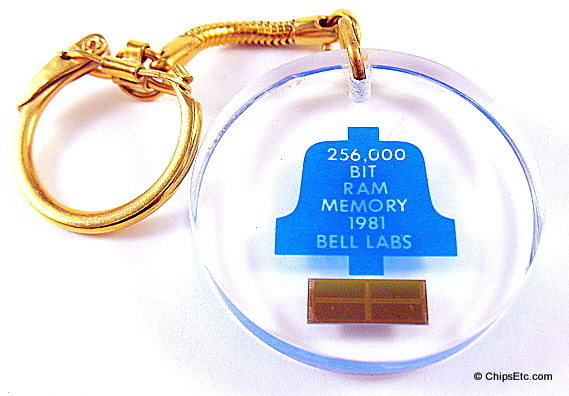 This Lucite keychain contains a 256,000 bit RAM memory chip from Bell Labs designed for use in Ma Bell's telecommunications systems. 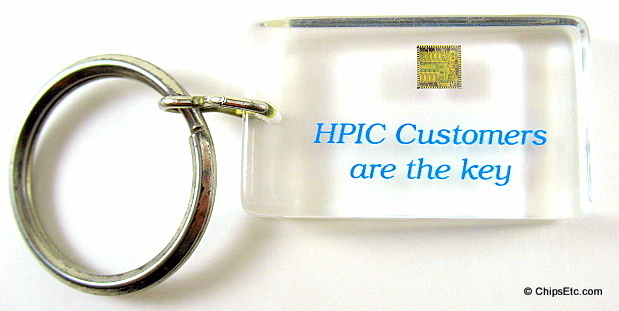 _This Lucite keychain contains a telecommunications network chip manufactured for use in Verizon's voice over internet (VOIP) business services using their Hosted IP Centrex (HPIC) architecture. Verizon’s converged VoIP network allowed it's customers to streamline voice, data, and Internet connections over one network. 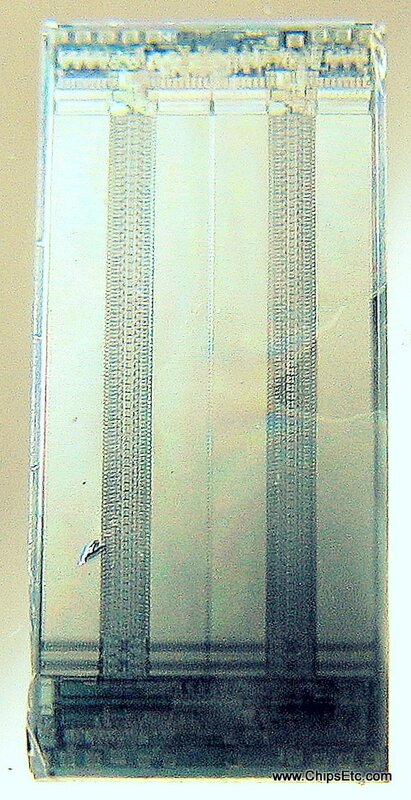 _This Verizon Lucite keychain is identical to the item above, except it contains a different type of telecommunications chip. 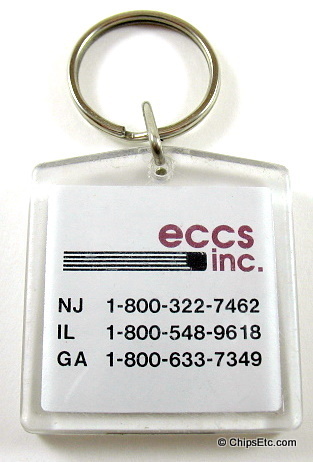 This Lucite keychain contains an Integrated Circuit chip manufactured at AT&T's Allentown Works semiconductor plant. 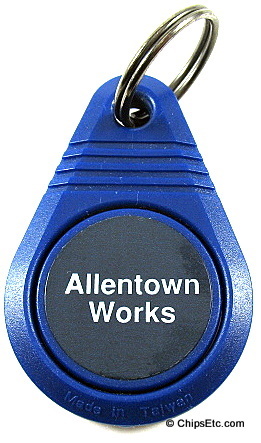 Reads "IC my Key to the future, AT&T, Allentown Works". 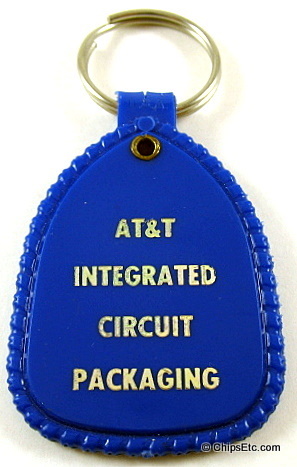 Blue plastic keychain given to AT&T employees who worked at Allentown Works and specialized in the Integrated Circuit Semiconductor Packaging division. 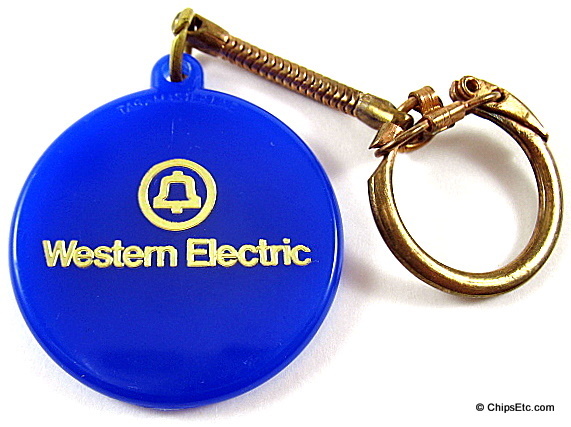 Blue plastic keychain given to AT&T's Allentown Works employees. 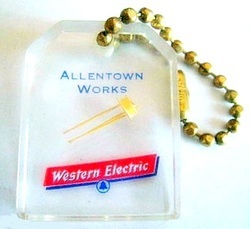 Blue plastic keychain given out to Western Electric's Allentown Works employees, promoting Allentown's lengthy history of producing transistors non-stop since 1951. 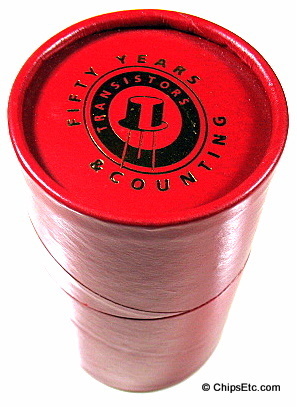 Reads "Allentown Home of the Transistor" on the front, and "Western Electric" on the back. Solid brass keychain given out to AT&T's Allentown Works employees. 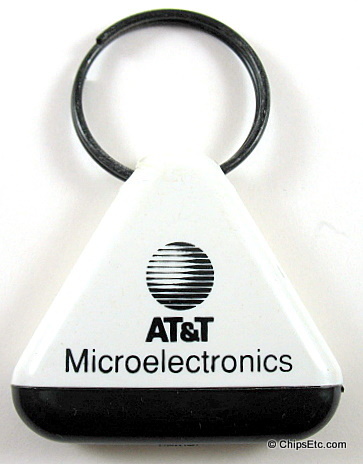 Plastic keychain has the AT&T logo and was given out to employees working at AT&T's Microelectronics semiconductor facilities located in Allentown, Pennsylvania and Orlando, Florida. 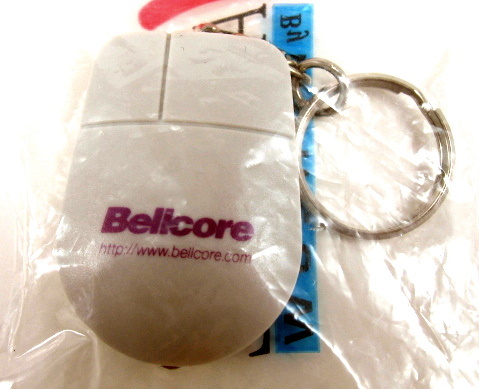 Telcordia Technologies, formerly Bell Research, Inc. or Bellcore, is a telecommunications research and development company based in the United States as was created as part of the 1982 break-up of American Telephone and Telegraph. 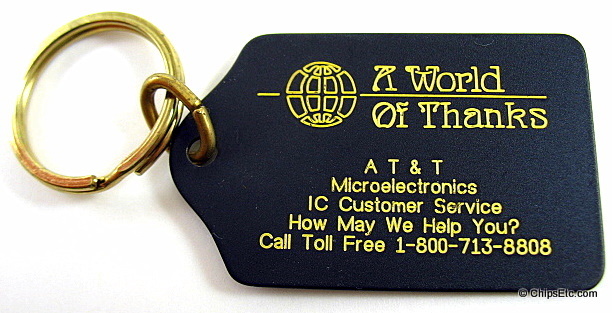 _Metal keychain was given out to AT&T employees promoting the company's Microelectronics Integrated Circuit (IC) customer service center at 1-800-713-8808. 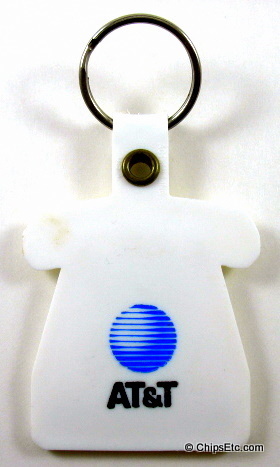 Soft plastic keychain given out to AT&T employees working at AT&T's Allentown Works plant. On the back it reads "AT&T The right choice". 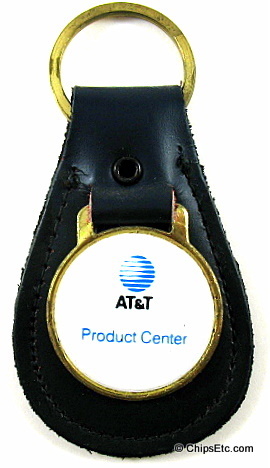 AT&T product center keychain given out to employees, features a brass medallion with white enamel background and AT&T logo. 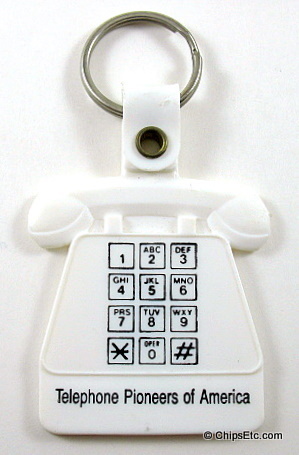 Plastic keychain resembling the famous AT&T touch tone telephone. Reads "Telephone pioneers of America" on the front and has the AT&T logo on the back. This item was given out to AT&T employees. 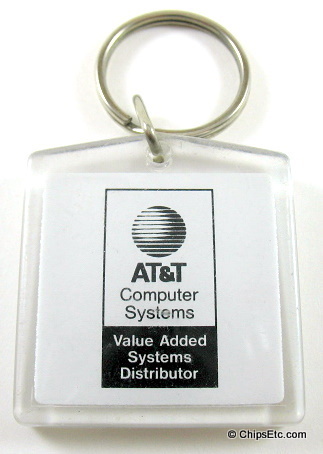 Clear plastic keychain given out to AT&T employees promoting one of AT&T's Computer Systems Value Added Systems Distributor, ECSS, Inc. Reads "ECSS Inc." on the back. ECSS (Enterprise Customer Service Solution) performed telecommunication and call routing services for AT&T.